Who is Mr. Macy? That question remains with you as you read Ms. Dotta’s first novel “Born Of Persuasion”. The riveting tale makes readers feel like Alice falling in the rabbit hole! The twists and turns are unfathomable as the protagonist Julia Elliston is orphaned, forced to choose a husband of nobility and eventually lands in one of the most elegant and upscale estates in England. Everything about her world is not as it appears. It seems like one character has literally been raised from the dead and Julia arrives in paradise. The ride is bumpy and shocking along the way. Don’t forget to pick up a dictionary if you are unfamiliar with the foreign lingo. 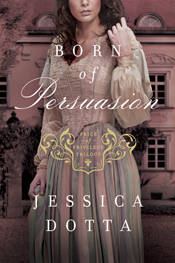 “Born Of Persuasion” releases in bookstores in September 2013. This entry was posted in Books, Entertainment, Reviews and tagged Born of Persuasion, Jessica Dotta. Bookmark the permalink.